Mundo Real’s home community of Rocinha has entered a defining moment in its almost 90 year history. But before continuing it is worth mentioning that organized crime and security policy are very sensitive issues in Rocinha, and for us, a small community-based organization whose members almost all live in the community, the need to address this issue delicately is even more imperative. This posting does not expose any inside information, pretty much everything herein could be found in the newspapers or by talking with local residents. The intention here is to provide a brief rundown of organized crime and security policy in Rocinha. Rocinha, like most low-income neglected urban communities, has always had a certain degree of illicit criminal activity. Long before the famous drug factions that are the target of the current UPP policy, there were small time dealers in Rocinha, mainly selling marijuana. By the mid 20th century up until the early 1980s bicheiros (the bosses of the local illegal gaming schemes) were the main form of organized crime in Rocinha. Among the first residents to really make a name for himself in Rocinha was a migrant from Paraiba who went by the name of Zé do Queijo. Zé do Queijo in a way defined how the traditional rural northeastern coronelismo values became implanted in the urban favelas, even if he viewed himself more as a local level justiceiro. He was a force to be reckoned with in the late 1970s and early 1980s in Rocinha, especially in and around the area of Rocinha known as Cachopa. Zé do Queijo owned a frequented birosca, or (small favela bar and store) and was active before the era of organized drug trafficking in Rocinha. Long time residents tell of how he walked around the community with his pistols either in his hands or on his waist. He was involved in multiple small business ventures and political activities and attempted to influence all facets of life in Rocinha. At the height of his power in Rocinha he would even quarrel with and on occasion kill some of Rocinha’s small time drug dealers. Ultimately he was murdered on his front doorstep in an event that remains shrouded in mystery to this day. His suspected killer, Maria Helena, an up and coming local activist associated with Rocinha’s residents association is usually blamed for orchestrating his murder after the two of them had been feuding for some time over political matters. Soon after, Maria Helena was also killed. Zé do Queijo is a historic figure in Rocinha’s criminal folklore, and he operated in a similar way to the early militias in Rio das Pedras and other favelas except he almost always acted alone instead of organizing his justiceiro activities. Like the traditional northeastern gunmen who fought to keep common crime and ‘indecency’ out of their communities, Zé do Queijo dominated with an iron fist his section of Rocinha for years. Not long after Zé do Queijo’s death organized drug traffickers began mobilizing and consolidating their power in Rocinha. This phenomenon had already begun in a few other favelas like Jacarezinho, Juramento and Morro do Dendê to name a few. The criminal factions that were born in Rio’s dictatorship era prisons would soon come to dominate almost all of Rio’s favelas, with a few exceptions like the case of Rio das Pedras. In Rio das Pedras, migrants from the northeast formed local milícia (militia) groups to enforce security and keep the drug trade out. Many of these early milícia members shared similarities to Zé do Queijo, and some of them even knew him personally because several of them were also northeasterners who had first lived in Rocinha before moving in the 1970s and 1980s to Rio das Pedras. In Rio das Pedras they originally called these local vigilante groups, polícia mineira, but now they are infamously known as milícias. The milícias of the 1980s and today share some common attributes but today they are far more organized and ruthless and they have infiltrated almost all levels of Rio’s political and security apparatus. In Rocinha, milícias did not take root, despite the community’s very heavy northeastern influence. An argument could be made that Ze do Quiejo and the rough and tough northeastern residents of Rocinha strongly opposed to the drug trade and its culture were one of the factors that kept it out of Rocinha for slightly longer than in a few other communities. Another very important cause was that the police, up until the mid 1980s, entered Rocinha frequently and with ease. This was a time period in which Brazil’s military dictatorship was beginning to transition to democracy but the police still had presence in Rocinha. The mid and late 1980s was an era in which organized drug trafficking became the norm in Rocinha, as well as most of Rio’s favelas. Already by the 1980s famous drug traffickers were part of Rocinha’s folklore and a new subculture associated with the drug trade was born. In the late 1980s and 1990s Rocinha became famous for its baile funks, some of the largest and rowdiest funk parties in the city that many middle class cariocas began to frequent as well. There are several factors that lead to the rapid expansion of Rio’s favela drug trade and criminal factions. One is the latent effects of the US war on drugs during the 1980s. The growing pressure on Colombian drug trafficking, in large part funded by the US, caused trafficker to search for new routes and markets, and more cocaine began being transported south of Colombia through Peru and Bolivia and into Brazil where most was eventually trafficked to Europe or the US. A large amount also remained in Rio and other cities, like São Paulo and Vitoria. The neglected favelas proved the perfect locations for Rio’s new flourishing drug trade. Many also blame two term governor of Rio de Janeiro, Leonel Brizola, who was a pioneering figure in the leftist PDT political party. Brizola implemented many policies and programs that were beneficial to Rio’s poor but he is often criticized for indirectly and unintentionally creating the conditions that allowed Rio’s drug traffickers to better organize and take total control of their communities. This is because Brizola was opposed to the kind of violent police incursions into favelas that were so common during the dictatorship. He took great strides to discourage violent police operations in the favelas and in many ways the presence of police in many favelas, like Rocinha, virtually disappeared during the late 1980s and early 1990s. While his intentions were certainly good, many claim that this allowed the gangs to flourish almost undisturbed. This is argument is debatable, but nonetheless a common discussion topic among residents and leaders in Rocinha who were active during this time period. Of course, if proper public services and more equal opportunities had been present in Rio’s favelas, then these ‘parallel powers’ would not likely have taken such deep root. In short, organized drug trafficking took very deep root in communities like Rocinha. 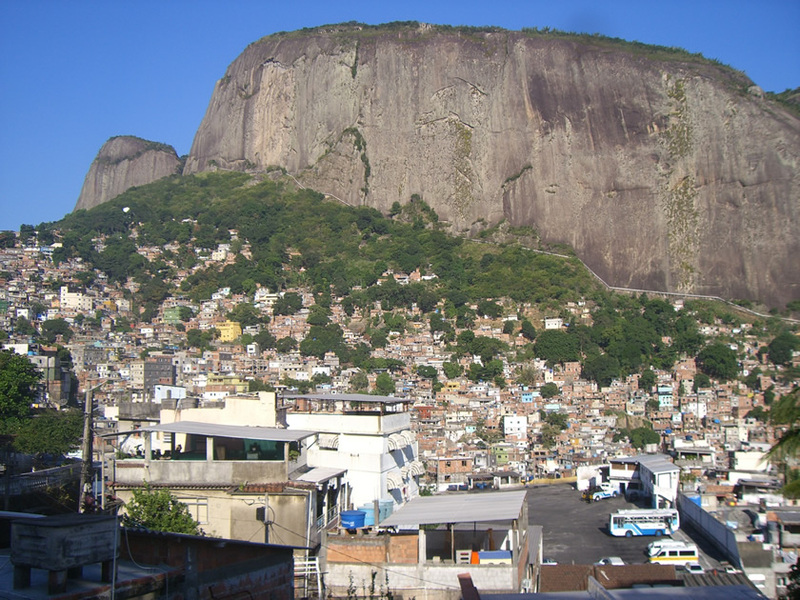 During the 1990s Rocinha emerged as the favela that sold more cocaine that any other in Brazil. Rocinha’s size and its strategic location between zona sul and the then rapidly expanding Barra da Tijuca made it an ideal drug point for middle class and wealthy cariocas. In fact, it has been estimated that roughly 75% of cocaine sales in Rio are to the middle and upper classes. Any long time resident of Rocinha would not have a difficult time believing this, because we are used to seeing how outsiders come to Rocinha to buy drugs, especially on weekends. Rocinha’s leading position in Rio’s drug trade continued to expand into the new century. In 2004 another historic event occurred in the community. On Easter weekend of that year there was an intense three day war in Rocinha as two of the traffickers and their respective soldiers fought over control of the community. The outcome was that Rocinha changed criminal factions to a newer but rapidly growing drug gang. This did not hinder drug sales, in fact Rocinha sold more drugs after switching factions. The 2004 shootout was pivotal for another more important reason, which will be discussed in more detail in upcoming blog posts. In short, the shootout sparked a movement. It served as a wakeup call to many active residents of Rocinha and neighboring São Conrado and Gávea. Organized civil society groups came together to work on ways of guaranteeing that violent episodes like the 2004 war would soon be a thing of the past. The dreams of many of Rocinha’s wealthy neighbors and developers to completely evict the community had faded by the 1980s as it became abundantly clear that Rocinha had grown far too large to be removed. Of course some came up with reactionary and ridiculous proposals, like calling for a large wall to be built encircling the community. This idea proved popular with certain conservative sectors of Rio’s population, and with many in Gávea and São Conrado, but was certainly not popular in Rocinha and with more progressive policy makers and NGOs. The idea to build the wall was abandoned for the time being, but like the theme of evicting favelas the theme of building walls around them continues to resurface from time to time. The violence in Rocinha in April of 2004 sparked what would eventually become, by late 2007/early 2008, the federal government’s PAC slum upgrading program in Rocinha and other favelas. How organized civil society began this process in 2004 is a very interesting story that we will soon cover in detail. In summary, Rocinha like any neglected and oppressed community always had its criminal and illicit elements. Zé do Queijo was the first well known heavy hand in the community. After him the drug trade took over all facets of life in the community. For roughly three decades residents of Rocinha have lived under what has been rightfully called a narco-dictatorship and the omnipresent subversive subculture it produced. Some residents of Rocinha have always preferred the drug traffickers to the authorities, but by far the majority have long wanted to see changes. Distrust of police is rife in Rocinha, as it is all of Rio’s favelas. The capturing of Rio’s most wanted drug trafficker, the boss of Rocinha since 2006, was a major blow to the power of the criminal faction there. Now a UPP has been promised in the very near future, probably beginning by Sunday November 13th. Residents are split on their opinion, and most are very reluctant to discuss this issue. Mundo Real will continue to keep posting events related to this historic moment in Rocinha’s history. For now we only hope that the transition is peaceful and transparent.